I was looking at my blog's statistics on Sitemeter and was surprised to see a huge influx of readers. 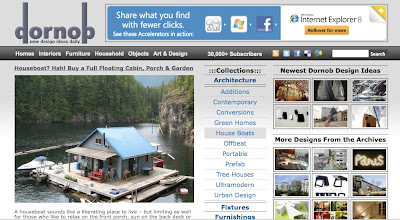 After a little research I discovered a very nice article about our float cabin on a website called dornob. ... where you will find out-of-the-ordinary designs that might not make it into your more traditional architectural, urban and industrial design publications – from over-the-top luxury to incredible design innovation. I was very pleased with the coverage. 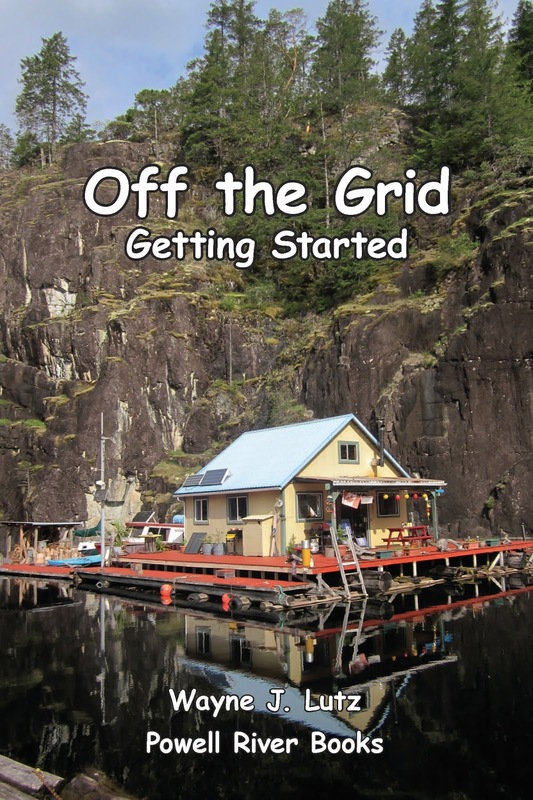 I always enjoy sharing our story of float cabin living. From the pictures, content and quotes, it appears their source was Kent Griswold's Tiny House Blog. 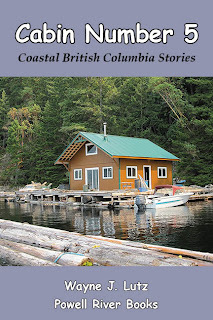 So, if you liked what you read at dornob, head on over to the Tiny House Blog for more. If you take Chuckanut Drive either north from I-5 or south from Bellingham, an interesting side trip is to Edison, Washington. From Chuckanut Drive take Bow Hill Road west. 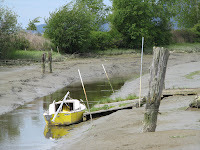 Where it makes a bend to the south, you will find the small town of Edison situated near the mouth of the Samish River and along the Edison slough. Edison’s main street has some interesting turn of the century buildings that now house restaurants, antique stores and bakeries. Edison was first settled in 1869. By 1876, there were 46 residents and a post office. In 2000, there were 133 people living in Edison. Call it small but mighty. And yes, the town was named for Thomas Edison, the famous inventor. Edison is about a mile from the Padilla Bay, but at high tide it is accessible by medium draft boats. This was a great benefit for the growing community. 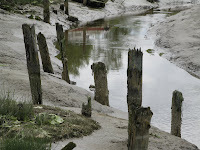 You can still see some small boats moored along the channel. The area is well known for seafood, especially oysters that are available at the local restaurants at very reasonable prices. Last week Wayne, Jeanne and I went to The Edison for lunch. 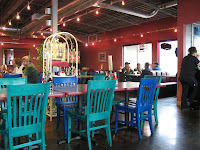 The atmosphere is casual and friendly. When the weather is nice, they have outdoor dining. Each night there's a different special. We recommend coming on Fridays for their steak and rib BBQ. There are pool tables, shuffleboard, TVs and evening entertainment - great for adults, but no minors are allowed. Down the street is the Breadfarm bakery. Go in the afternoon and watch them make bread. We got the Chuckanut Multigrain, but they have several flavors and styles to choose from. If you go to the Bellingham Farmer’s Market, stop by their booth for a quick and easy bread fix. We left Bremerton National Airport early in the morning for the second left of our flying mini-vacation. Originally we had planned to take the ferry from Bremerton to Seattle for a day in the city, but decided at the last minute to continue on our journey. The weather was just too nice not to get back up in the air. We followed the Columbia River west with the snow capped Olympic range to our right. The west coast of Washington State is a long strand of sandy beach. The airport at Ocean Shores is a perfect landing spot. It's slightly above sea level with clear approaches on both ends. The only caution is frequent crosswinds coming off the nearby waters. Wayne took the honours and landed. The Ocean Shores Airport runway is 2700' long and I'm a bit rusty right now. It's always nice to have his extra experience on board. There's no weather information available so we got the ASOS (Automated Surface Observing Systems) from nearby Bowerman Airport at Hoquiam. As we got closer, we got a report from a departing twin, wind calm and CAVU (ceiling and visibility unlimited). There's a lounge and restroom available on the field that was built about five years ago with a combination of donations, city funding and state grants. To get to town it's about a thirty minute walk. But be careful, there are no sidewalks. There's a local taxi, or if you stay at the Shilo Inn like we did, a courtesy van. We even had a local stop and offer us a ride, but it was such a nice day we decided to walk. Last weekend we had a wonderful flying trip around Washington State. One of our destinations was Ocean Shores, an open stretch of the Pacific just north of the Columbia River. We got a room at the Shilo Inn with a dynamite view with the ocean below and the sky above. During the day we could see the lines of breakers rolling in after their long voyage from Japan. With this wonderful stretch of good weather, Wayne and I decided to take 997 out for a much needed cross country trip. We wanted to try something new, so we decided to head south from Bellingham to Bremerton, Washington. It's only about an hour away, but long enough of a flight to get us back feeling comfortable in the air. We departed Bellingham IFR for the practice, not because of the weather. 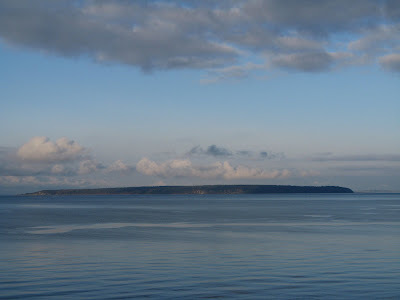 We got the expected KIENO TWO departure southwest bound over Whidbey Island to the southern tip of Puget Sound. 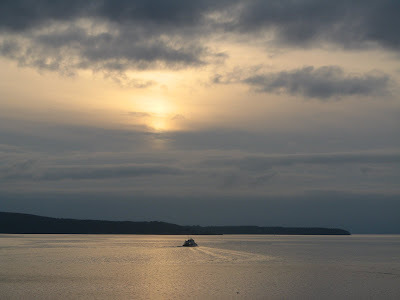 Whidbey is one of the longest islands in the United States with lots of nooks and crannies for boating fun. Seattle approach gave us a heading to line us up for a straight-in to Runway 19 at Bremerton, but once we had the runway in sight we cancelled IFR and circled to use active Runway 01. One of the reasons we picked Bremerton was because of its nice big runway. It's 6000 feet long and 150 feet wide and in excellent condition. There are IFR approaches (if needed) and easy to use self-serve gas pumps. We only filled 997 to the tabs so that we have more flexibility for our next stop. We know it won't be far, but it might be a shorter strip, so the reduced weight will help our landing and takeoff performance. Bremerton has something that is becoming rare at airport these days, an Airport Diner. We decided to stop for dinner before getting a taxi to town. It's definitely a place for pilots and locals alike. Friday and Saturday are prime rib nights and their fish and chips is an everyday special. We had the cod and it was wonderful and very reasonable. And I love the decor with model aircraft everywhere. My floating garden is relatively small, consisting of four 3X10' beds raised above the lake surface on a cedar log foundation. I use Companion Planting and Intensive Cultivation (Rodale Press, 1989) and grow an amazing amount of vegetables in the limited space. But I still haven't figured out how much to plant, especially for root crops. I always end up with a row or two left at the end of fall. 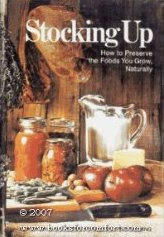 A really helpful book on preserving crops is Stocking Up: How to Preserve the Foods You Grow, Naturally by the Editors of Organic Gardening and Farming. It's a great reference for harvesting, storing, drying, freezing and canning fruits, vegetables, meats, dairy products, and nuts, seeds and grains. It gave me directions for leave my root crops in the ground through the winter. 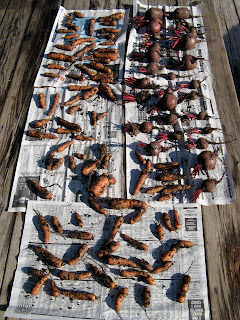 Now that I have my carrots and beets out of the soil, I'm going to use their directions for storage (well, sort of). First I pulled all of my remaining crop and discarded any damaged ones. I removed and composted all the carrots tops. But for the beets, I tore the tops off leaving about three inches of stem. To help prevent them from "bleeding" red beet juice, the book recommends not using a knife for this part of the process. Because the soils was so wet, I arranged the unwashed veggies on newspaper to dry a bit. After about thirty minutes I gave them a flip to dry the other side. Then finally, I rubbed off the excess dirt with a dry paper towel. The next step was to arrange the cleaned (not washed) carrots and beets in plastic trays I purchased at the Dollar Store. The open sides allow air to circulate. This helps reduce mold or rot as time goes by. I started with a damp paper towel on the bottom covered by a folded sheet of dry newspaper. The damp towel helps increase atmospheric moisture which helps keep the root crops crisper while being stored out of the ground. After one layer of veggies I folded a sheet of newspaper and then added a second layer to each basket. The final step was to cover the top layer of veggies with folded newspaper, a layer of moist paper towel and finally another folded newspaper. To store the baskets, I place them under the bed in my downstairs guest bedroom. It is the coolest room in my house. ... or so it appears. Ed has a funny sense of humour. In lots of ways, it reminds me of my dad's. You have to listen carefully and sometimes read between the lines. Powell River is built on the sloping shores of Coastal BC overlooking the Strait of Georgia and Vancouver Island. This time of year we get lots of cloudy skies. But on some days, we get a patch of sun at the end of the day. Ed's name for it is the "Powell River Finger." 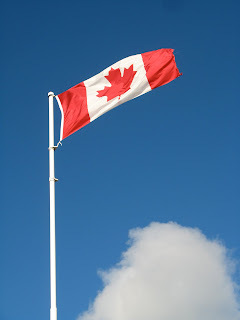 Today's the second anniversary of Wayne's and my landing as a permanent residents in Canada. Wayne's a little more worldly than me having lived in New York, New Jersey, Texas and California. I was a Los Angeles County babe, born and raised. But we both were well traveled thanks to our airplane 997. 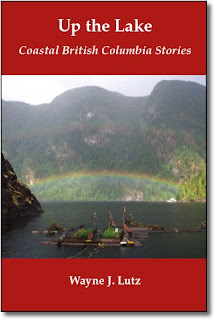 We discovered Powell River BC in 2000 during a flying camping trip to BC. Actually, that's not the whole truth. 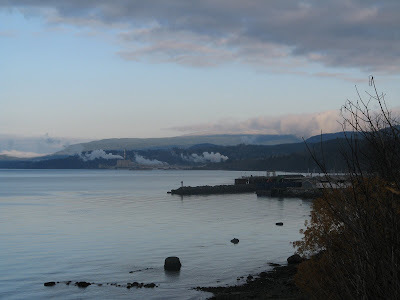 We discovered Powell River twenty years earlier as a gas stop on a similar trip. But, first impressions aren't always accurate. We needed fuel and Powell River seemed a likely spot. It was "obvious" it was an industrial mill town, so we flew off to a remote strip to camp for the night. But in 2000 we took the time to stay, and that's all it took. That one night stretched into the full two weeks we had for our summer vacation. The next December we returned to see if we could handle the winters. The answer was a resounding yes, but we couldn't find a suitable property for part-time visitors. The next summer we almost didn't return, but something drew us back at the last minute. And that's the real beginning of the story. We decided to rent a tin boat so we could explore Powell Lake. We packed a picnic and headed for Goat Lake. On the way we saw the most amazing sight, float cabins dotting the shore. We were very excited about what we saw. So much so, that we asked the proprietor at the boat rental if there were any for sale. He said yes, but he was sure we wouldn't like it. It was right next to a big rock wall. Well, if you've followed my blog you know that was the turning point of our lives. Yes, we had to go back to LA for a few years to complete our careers, but every holiday we returned to our float cabin on Powell Lake. We started living our dream. But after we retired (early for both of us), we wanted more. We wanted to live the dream full time, and that required applying for residency. So we chose to become Canadians. It was a huge step, but one we took with great enthusiasm. Like the lines in Sloan's song "The Rest of My Life:"
Tourism BC had a campaign called "The Best Place on Earth" to encourage British Columbia residents to vacation at home. If BC is the best place on earth, Powell River is the "Absolute Best Place on Earth." This morning I was driving along Marine Avenue. Right there in front of me was a beautiful sight. The rising sun was shining off the calm waters of the Strait of Georgia. The sun tinged clouds were parting to reveal clear blue skies. It just doesn't get much better than that. As I stood at the viewpoint taking in this glorious sight, I met a man who has lived here for sixty years. As it is in a town of this size, he was the father of someone Wayne and I know from up the lake and have business dealings with in town. We stood in the brisk morning air while he told of days gone by when he worked in the paper mill, and of his vision for the future of his community and country. 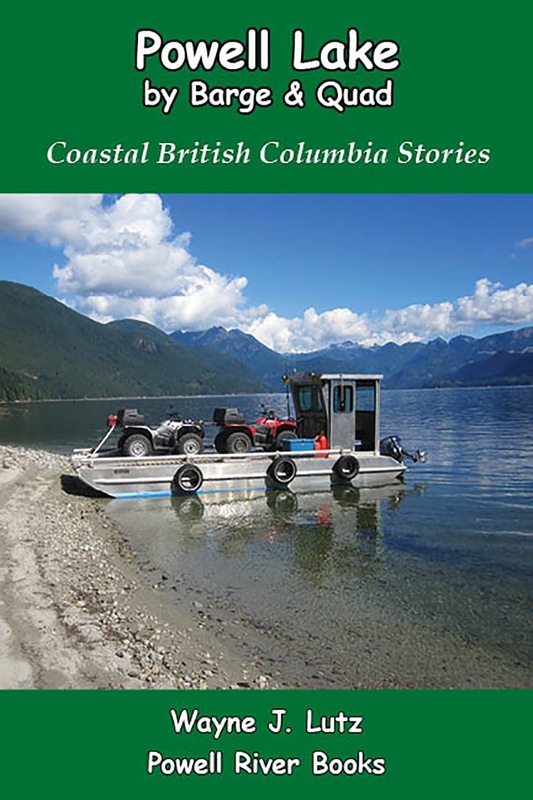 He talked about salmon fishing with his wife, raising his daughters and sons in a safe environment, his cabin up the lake, and his jobs at the mill. 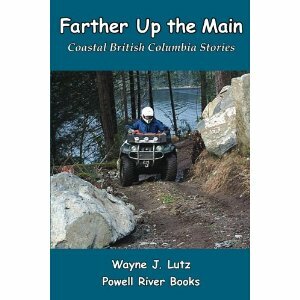 While some of his children have moved to other parts of BC, some are still here in Powell River. And when they have a reunion, where do they want to go? Up the lake of course. Our friend John is an amazing float cabin construction engineer. Right now he's building Cabin #5 here on Powell Lake. Wayne and I know the workmanship and care John takes because we live almost full time in his Cabin #3. John can see things in his head and make them come to reality. But he also gets a lot of help from his dad Ed. You can see how the talent for float cabin construction runs in the family. Ed's a wizard at architectural designs. He spends hours on his computer creating the plans needed to construct Cabin #5 in precision detail. When he can, Ed comes out to the construction site with his binder of drawings to not only supervise, but lend an experienced hand. In addition to his detailed plans, Ed also created an animated video of the construction process. I have uploaded that video to YouTube. ... as the Glen Burtnik song goes. When Wayne and I first came to Powell River BC, we immediately started listening to the local radio station. We're a small town so there's only one. It was called CHQB at 1280 AM. The format was country with lots of local programming. That's where I got my theme song, The Truck Got Stuck by Corb Lund. 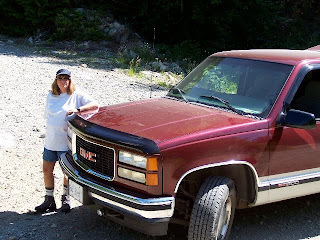 I'd just purchased my GMC 4X4 and it made me think about driving in the bush. Reception up the lake wasn't great, but we listened for hours. My favourite features, other than the great tunes, were the local news and Telemarket. Call in with your items to sell and leave your phone number for prospective buyers. You learn a lot about a town on a show like that. 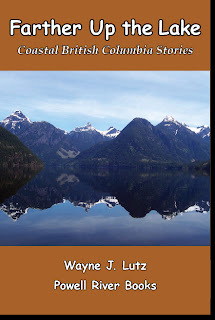 Roo (now on JRfm in Vancouver) even interviewed Wayne about his first book, Up the Lake. I really miss that original format! One day I was driving my truck into the bush towing my quad. I turned on the radio and to my surprise there was no country music. It was now the New Magic and the music was a mix of oldies, pop, easy listening and local information. John Stevenson was the morning anchor. In the evenings we still could listen to live broadcasts of the Kings home hockey games. Then a little over a year ago the station "flipped." The word came through the reliable taxi driver grapevine. 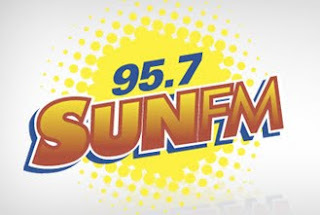 Now it's Sun and can be found at 95.7 FM. The music has improved and we get syndicated Ryan Seacrest on weekends (unless he really comes to hang out in our great little town!). You can even listen live on the Internet. But alas, no more Telemarket. Bummer! But we do get to hear His Worship the Mayor on the news quite frequently. He keeps us informed about local happenings along with Brittany King, the new morning personality from Red Deer. What to do to celebrate our friend Jeanne's new job? Go to lunch, of course. Mom, my sister MaryLee, Jeanne and I decided to meet in Birch Bay for lunch. 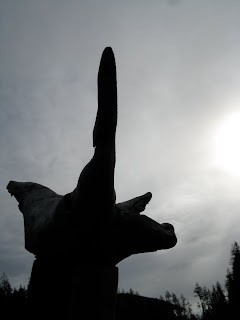 We headed north on I-5 to Birch Bay-Lynden Road. Just a straight shot due west until you reach the ocean. Turn left and in a few short blocks you will see the Shores Restaurant in the Sandcastle at Birch Bay Resort. The Shores is at 7854 Birch Bay Drive. We opted for an indoor ocean view window booth. The outside deck was a little too breezy even though it was a lovely sunny day. They are open for breakfast, lunch and dinner daily. Lunch has lots of northwest theme entrées, sandwiches, soups and salads to choose from. We had the homemade clam chowder, special prime rib sandwich, fish and chips, and fried oysters. The fries were great, with a thin crisp batter coating and piping hot. A cool dip of blue cheese dressing, yum. Warm comfort food for a cool Saturday afternoon. Looking for a good place for a girls day out, a nice meal with an ocean view or local brew while watching your favorite game or Olympic event? Head for Birch Bay and the Shores Restaurant.